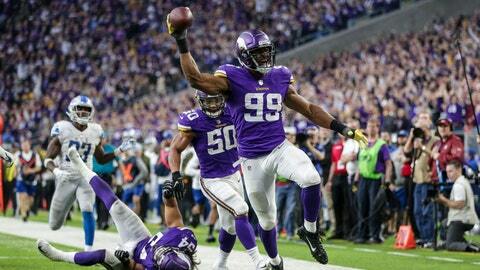 Minnesota defensive end Danielle Hunter returns a fumble for a touchdown during the fourth quarter. Hunter had 3 1/2 of Minnesota’s franchise-record 10 sacks plus a fourth-quarter fumble return for a touchdown, tormenting Stafford and the Detroit Lions all afternoon in a 24-9 victory by the Vikings on Sunday. After Dalvin Cook dropped a pitch from Kirk Cousins and A’Shawn Robinson recovered at the Detroit 28 with Minnesota leading 17-6, the Lions converted a fake punt to keep that drive alive. Two plays later, Stafford ran right on the short side of the field and tried an option-style flip that Kerryon Johnson was unable to secure, and Hunter scooped it up on his way to the easy score. With one burst through a big hole in the left side of the line , Cook made clear he’s healthy again with a 70-yard gain in the second quarter to set up a short touchdown catch by Thielen. According to the NFL’s NextGen Stats tracker, he averaged 22.07 mph during that run for the fastest in the league this season. The Lions have allowed a rush of 50-plus yards in four different games this year. “It’s a big shot to our pride,” left guard Frank Ragnow said. Lions: DE Ziggy Ansah (shoulder) returned from a six-game absence with had a sack in the closing seconds of the second quarter that forced the Vikings to settle for a field goal. … LT Taylor Decker left in the third quarter with an undisclosed injury but later returned. Vikings: LB Anthony Barr (hamstring) and LG Tom Compton (knee) were held out for the straight game, and SS Andrew Sendejo (groin) missed his fourth straight contest. … Backup TE David Morgan hobbled off in the third quarter with a left knee injury.